Throughout Australia General Motors cars have given some remarkable demonstrations in various motor racing events. The stamina which is built into all General Motors cars equips them to withstand all tests to which they may be subjected. On the Proving Ground, in the Research Laboratories, tests are conducted which ensure that the best of material and the best of workmanship is built into each General Motors car. All over the world there are scores of instances of exceptional and arduous tests to which General Motors cars have been subjected, and from which they have invariably emerged with credit to themselves and their drivers. Many of our dealers in Australia have driven General Motors cars to victory in tests and races in their own districts. At the annual sports meeting of automobile clubs there is usually a race or some test in which cars compete, and General Motors dealers like to take part, for, in addition to proving the worth of the car they handle, the contest gains for them a good measure of publicity in their territory. One race which has figured recently among the motoring annals of Western Australia was that at the annual sports meeting of the Eastern Goldfields branch of the Royal Automobile Club of Western Australia. This was held on Lake Perkolilli, about 25 miles from Kalgoorlie, at the beginning of September. Lake Perkolilli is the finest natural racing track in the world. It is the dry bed of an old salt lake. Its area is large; it is as flat as a billiard table, and devoid of plant life of any sort. On this old salt lake a two miles circuit has been mapped out, on which some remarkable speeds are developed. At this particular sports meeting some of the cars lapped the course at about 96 miles per hour. Mr. E.T. Armstrong, of the Armstrong Cycle and Motor Agency, General Motors dealers at Kalgoorlie, Western Australia, was the winner of two events. One of these was the open handicap of eight miles; the other the members handicap of six miles. Mr. Armstrong had a further achievement in coming third in the State championship event of 20 miles. For each of these races Mr. Armstrong used a standard Buick, the other cars being in nearly every case special racing models. In the State championship the first and second cars were special racing jobs, whereas Mr. Armstrong’s Buick was standard in all respects, except that is was stripped for racing. Mrs. Armstrong says that the Buick was absolutely faultless from start to finish. 1st – Open handicap, 8 miles. Time, 6.21-75 m.p.h. standing start. 1st – Member’s handicap, 6 miles-73 m.p.h. standing start. 3rd – State championship, 20 miles-78 m.p.h. standing start. 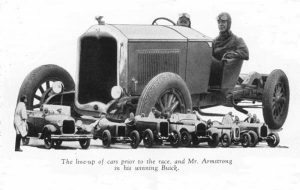 These records constitute a very excellent performance on the part of Buick in the able hands of Mr. Armstrong.